According to Boin et al., public leadership during times of crisis must be prepared to address four distinct stages: sense making, in which participants try to grasp the nature, severity, and likely consequences of the unfolding crisis; decision making whereby the who, what, and when concerning the reaction to the crisis have to be agreed upon; meaning making during which public expectations are weighed and managed; and termination, which covers political and operational responses to the crisis. While the four-dimensional framework has been primarily used for analyzing governments’ reactions to a wide range of “traditional” crises, it also offers a good basis for understanding and managing crises in the digital age. More specifically, the framework can be applied by embassies or Ministries of Foreign Affairs (MFAs) for developing digital strategies necessary for managing crises in real-time, such as those triggered by terrorist attacks or natural disasters. Once a crisis begins to unfold, confusion about the nature, severity, and possible implications of the event is the immediate consequence to affect both authorities and the public. Ironically, this outcome is not prompted by the shortage of information about what is going on, but rather by the abundance of reports on social media channels, most of them reflecting individual reactions to the event, often times with little factual evidence to support them. Accurate sense-making thus emerges as the first order of business for embassies and MFAs and should be attended to with great care. Using a digital dashboard application (Hootsuite, TweetDeck, or Buffer), the crisis situation could be monitored in real-time by tracking relevant hashtags, official accounts of local authorities (see the example below of the Crisis Center in Belgium), media channels, and messages posted by other embassies within the local diplomatic community. Three aspects are particularly important to look for: whether any nationals are involved in the crisis as victims or perpetrators, whether the magnitude of the crisis does not overwhelm the capacity of the embassy to handle it, and whether the situation is likely to negatively affect the bilateral relationship. Once a preliminary assessment of crisis situation is made, speedy decision-making is of crucial importance. Nationals and their relatives back home need to be immediately informed about the channels for emergency assistance (see the U.S. and Canadian examples below). As good practice, a WhatsApp “crisis cell” including the ambassador, the embassy’s digital communication officer, and a senior MFA official would be useful to establish with the dual purpose of enhancing MFA-embassy coordination and reducing decision-making time. To avoid inevitable complications induced by the “fog of the crisis," MFAs should pre-design reaction scenarios to be activated in collaboration with embassies depending on the evolution of the events. Such scenarios may include fast-track decision-making procedures, preferred channels of communications, ethical guidelines, and offline/online integration arrangements. By their very nature, terrorist attacks and natural disasters are fast-paced, info error-prone, and emotionally draining events. Public expectations need therefore to be managed in real-time with accurate updates and emotional intelligence. This requires a sober, reassuring, and fact-based style of communication, in which inevitable inaccuracies must be promptly and professionally corrected (see the FCO example below). Information transparency could be particularly challenging in times of crisis. 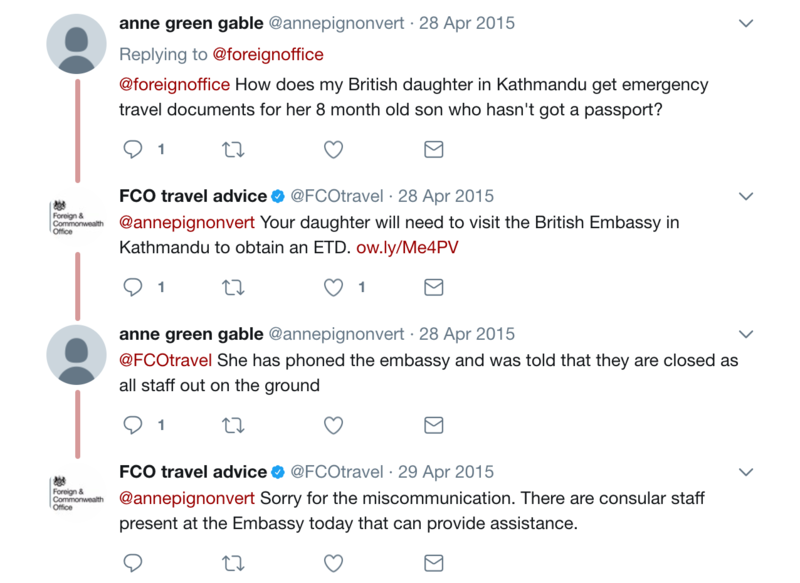 On the one hand, the credibility of the digital channel of the embassy depends on the accuracy of the messages disseminated to the public as well as on its scope of disclosure. On the other hand, full transparency could risk amplifying the sense of panic in the audience and flood the channel with excessive and possibly inconsequential requests. The trade-off between full disclosure and efficiency ought to be decided by the “cell crisis,” but as a rule of thumb one would expect relevant information to be disclosed to the extent and at the pace that allows the embassy’s digital channel to function adequately. Finally, once the crisis is over or about to conclude, the embassy needs to reflect on the political and digital circumstances pertaining to crisis termination. Politically, rituals expressing solidarity with the host government (in the case of terrorist attacks; see example below) are particularly important for showcasing the commitment of the embassy to the values and policies underpinning the bilateral relationship between the two countries. Digitally, a thorough “post-mortem” analysis of the crisis communication strategy needs to be undertaken with the purpose of identifying the most successful techniques of engaging the audience as well as the mistakes and errors that have negatively affected the communication process. The lessons thus learned should be used to update the set of guidelines of good practices for digital crisis management and disseminated to the other embassies by the MFA. To conclude, digital platforms have emerged as indispensable tools for managing diplomatic crises in the digital age and for good reasons. They can help embassies and MFAs make sense of the nature and gravity of the events in real-time, streamline the decision-making process, manage the public’s expectations, and facilitate crisis termination. At the same time, they need to be used with great care as factual inaccuracies, coordination gaps, mismatched disclosure level, and poor symbolic signaling could easily derail digital efforts of crisis management.